For Texas to be such a big place, it felt awfully small this weekend. Maybe it was because there were so many little blessings that made such a huge impact on my heart! Thank you to Traci Payne for the beautiful photos. To see the entire Facebook photo album, click here. For those of you who joined the photo booth fun, you can view your photos here. For example, I met Amy. 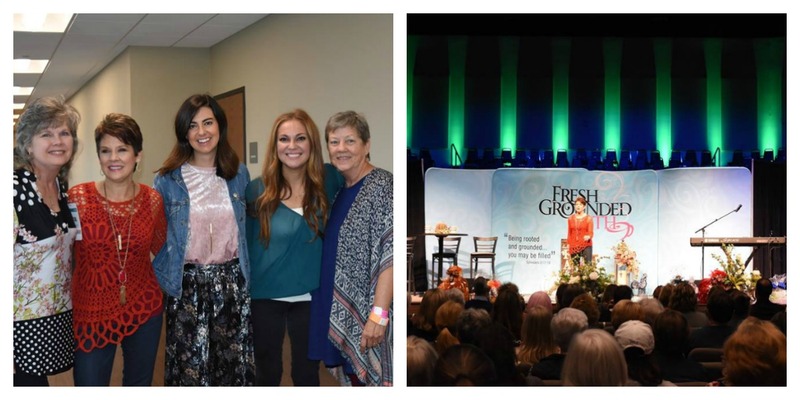 She served as the professional counselor this weekend at Fresh Grounded Faith Lubbock. Oh my—I think I met my double! Amy’s the pianist for Southcrest Baptist Church where the conference was held. She’s loads of fun, she’s sweet and spunky, and she sings. Girl, she is a “She Can” woman! And, did I mention that she just happens to be blind? It was a short encounter which made a forever impact on me. Then there was our Security Team Leader, a four-star general! He saluted Terrie, our National Conference Director, every time they passed each other walking the long commons area during the conference. He could have been anywhere this past weekend, but he spent his time with 1,400 women, making sure all was safe. Or, maybe he was there because 1,400 women all in the same room need a four-star general to keep us in line! He may have seen his time as a small sacrifice, but it was a big blessing to us. You get the idea! Nothing is small or little when it comes to God—everything He does is big … even when we aren’t in Texas! I taught from Psalm 23, and Angie Smith shared from Ephesians 3. We learned and laughed and were inspired by God’s Word. All weekend, Meredith Andrews led worship. Not to belabor the theme here, but that girl has such a giant voice in a teeny weeny package! And, as usual, Shaun Groves was the most amazing storyteller and inspired all of the women, including me. A big thank you to Local Conference Coordinator Brenda Richardson and to all of the volunteers who took such great care of us in Lubbock. And to Southcrest Baptist Church and the co-host churches who made us feel so loved and welcomed, please accept a huge, Texas-sized thank you from all of us to all of you! Here’s what God did: we celebrated 4 new sisters in Christ, 30 women who chose to renew their commitment to Christ, and 112 children sponsored through Compassion International. Thank you, Jesus, for the decisions and the tremendous response of children being rescued from poverty! All honor and power and glory to our Savior! We just can’t overestimate what God can do. He is Lord over little things and Lord over big things, and when He is in it, all things are a blessing! Were you with us in Lubbock? Please share your favorite part of the weekend in the comments below.